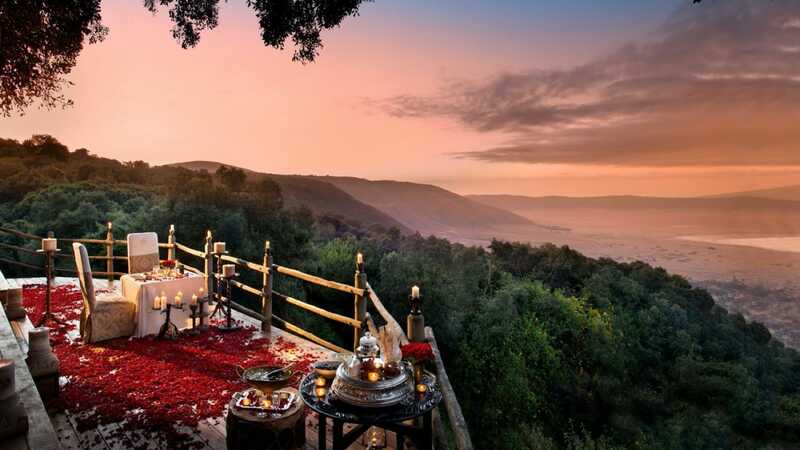 Tanzania is quite likely not the first place that springs to mind when you think of romantic holiday destinations, but it’s an inspired choice nonetheless, especially if you and your loved one enjoy a touch of adventure and excitement on your romantic travels. Whether you prefer private romance by the beach or indulging in absolute safari luxury and pampering, whatever you are looking for you can likely find it in Tanzania (except maybe a skiing lodge!). With dozens of heavenly beaches, prolific national parks, five-star safari lodges and the most obliging people on earth, Tanzania is the perfect place for a romantic getaway with a difference. Going on a romantic sojourn is all about making special memories together that the two of you can share for years to come. And what could be more special than witnessing a playful herd of elephants cavorting in a muddy waterhole on a hot day, or watching a cheetah stalking across the savannah… The scenery in Tanzania is sublime and the animals abundant. Going on a safari doesn’t mean you have to rough it; there are numerous luxury safari camps where you can enjoy a wildlife-watching experiences in the lap of luxury. Tranquil and picturesque lodge settings, high quality service, superb food, spa facilities and a dreamy ambience ensure a romantic escape second to none. Opulent Sasakwa Lodge in the exclusive Singita Grumeti concessions is just such a place. It doesn’t come cheap, but – if you can afford it – you will never forget it! Arguably the best place for romantic escape is a tropical island where you and your partner can decompress and reconnect on tropical beaches without a care in the world. With its dazzling sun-bleached sands and palm-fringed shores, Zanzibar is the picture of paradise. Coming here for a rest after your safari is the perfect way to unwind and round off your trip to Tanzania. There are numerous fully-inclusive resorts throughout Zanzibar where your every need will be taken care of so that the two of you can enjoy spending quality time together in stunning surroundings. A stroll along the beach at sunset followed by a romantic meal for two is the perfect way to spend an island evening, while a sundowner cruise in a traditional dhow (wooden sailing boat) will allow you to explore some of the smaller isles in the Zanzibar archipelago. If you’re looking for a Zanzibar accommodation recommendation, The Palms was recently selected as one of the world’s most romantic seaside resorts by Travel & Leisure magazine. So, if it is luxury that you are after, and if money isn’t a problem, the six exclusive and spacious 140 square metre villas of The Palms is quite likely just the place for you.